There are many times in life when a do-over can come in handy. 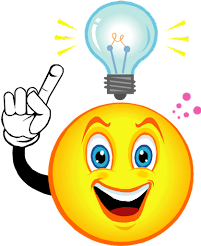 Perhaps you clicked “Send” on an email that was better left unsaid, or “Delete” on a contact before realizing you still needed it. Just like Gmail lets you unsend a message, you can now have a second chance with your contacts too. We’ve added a new feature to Google Contacts that allows you to revert your contact list and undo any mistakes made up to 30 days in the past. Let’s say you accidentally deleted a bunch of contacts or wiped the contact data from your Gmail account by mistake while syncing to another device. 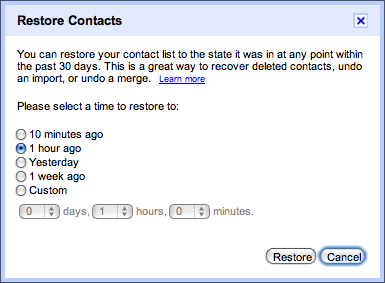 Visit Gmail’s Contacts section, select “Restore contacts” in the “More actions” menu, and choose the time you would like to revert to. Your contacts will be restored to exactly the same state they were in at that time — any contacts that didn’t exist then will be deleted and any that have since been added will be deleted. Don’t worry, you can always undo this change by restoring again if you didn’t get the time right.